This is a potential restoration car at first glance. The car is complete and runs and drives. Engine has a knock. 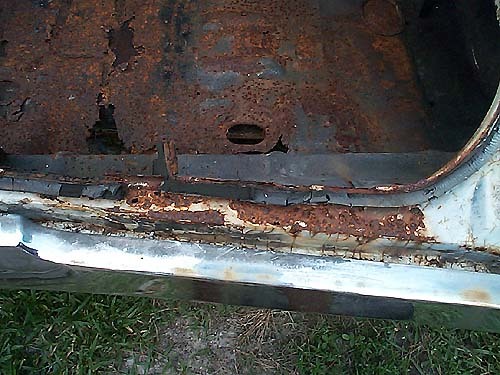 Body is rusty except for doors which may have been replaced. 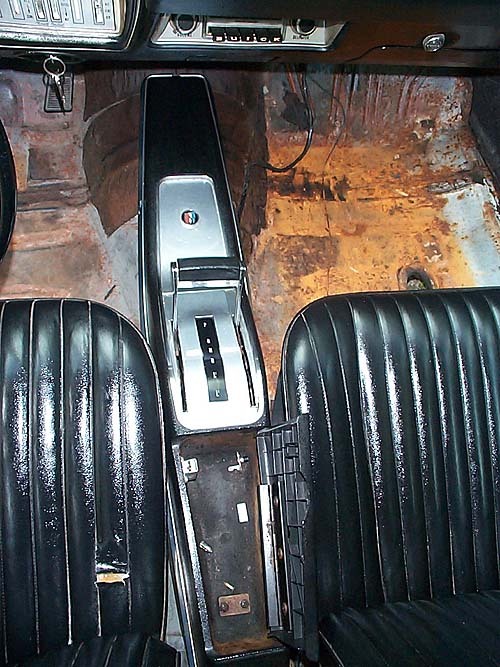 The car is a 1968 GS400 w/TH400 trans, ps, pb, ac, speed-alert, clock, am/fm radio, 3.42 posi, buckets and console, black interior, had a factory vinyl top. It is 1 of 10,743 GS400 coupes made in 1968. This is another pic from the left side, car is straight but rusty. 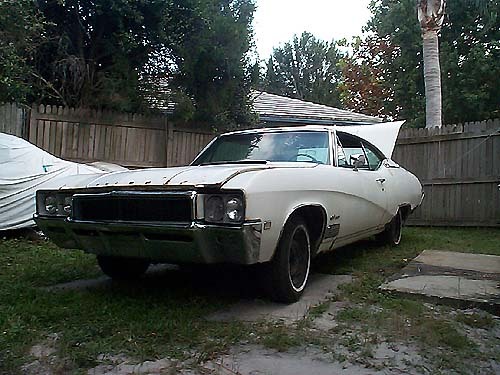 This typical of GM A-body (Chevelle, LeMans, Cutlass, Skylark) cars. This is a bad case of rust since the entire panel behind the tire is rotted away inside and outside. Even the wheel wells are rusted away. This is a northern car, from Illinois, where heavy winter road salt is applied. 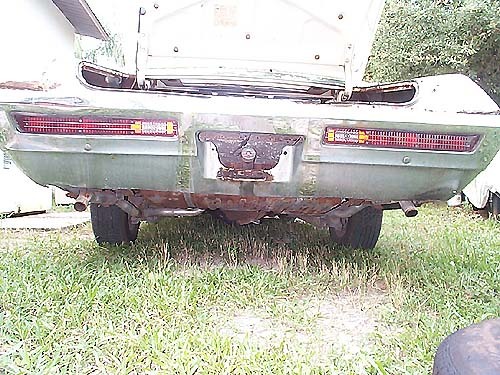 Here is a rear shot of the bumper and rear axle. Lenses are in exc. cond and the rear bumper is straight. Bumper will need to be replated.. This is bad news! 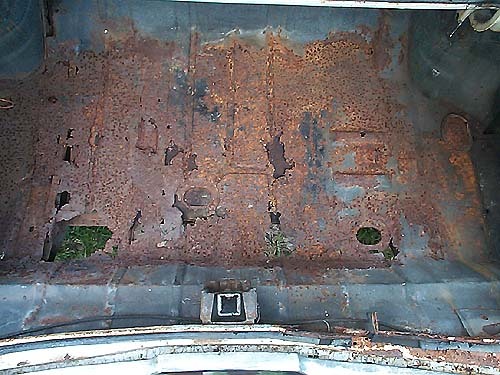 The entire trunk floor is rusted away from left to right and front to back. Always a bad sign when you can see the ground/grass through the trunk floor. Major repair job here. 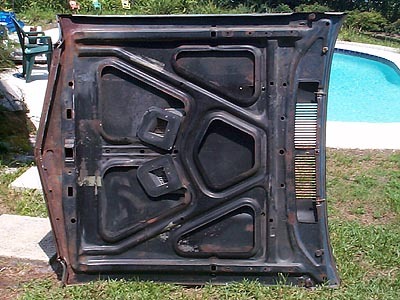 The replacement panels alone are $300-400 plus you need to remove the old panels and gas tank. This is a difficult job and is usually left to the pros. Also, notice the trunk lip is completely rusted away. 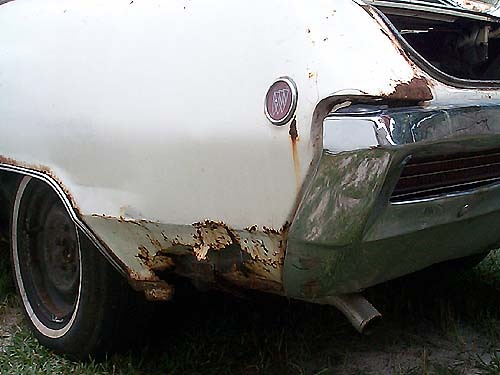 This is nasty rust in the trunk lip channel. The entire channel is rusted away which lets water run into the trunk. Only way to fix this is to remove a good trunk lip from a donor car and have it welded it in. Another difficult job. This is the culprit for the trunk rust. Water always collects in the rear window channel. When the channel rusts through, the water drains into to the trunk rusting away the floor as pictured above. 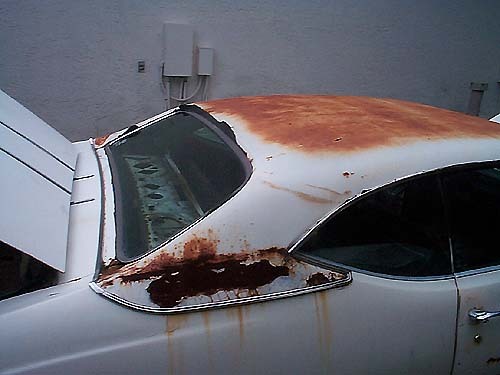 This car had a vinyl top which is a major rust problem. Also, notice this car has two large holes just to the left of the trunk lid. This is very unusual and will not be found on many cars. Here is the right side with the same problem. This shows some trunk lip rust. 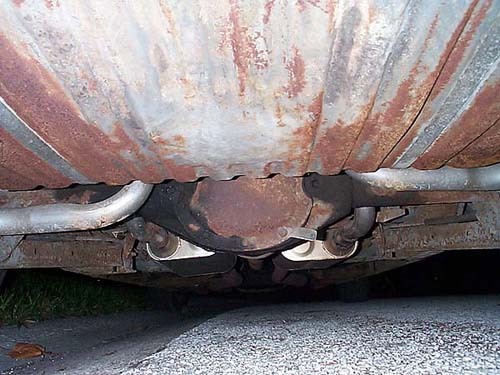 Trunk is badly rust and is completely rusted through across the entire lip. This is not common on Skylarks. This car has a clean front end. Even though the grille has a few cracks. It is complete and correct for a GS. Skylarks use a different grille. The front bumper is in exc. cond. Nice driver's door panel w/correct armrest base, 16". The carpet is faded but just needs some dye to make it look new. Use SEM vinyl dye for best results. Clean instrument cluster w/ac controls, speed-alert and clock. Adjustment knob on the left side is for setting speed-alert, when the set speed is exceeded, a buzzer sounds inside the car. 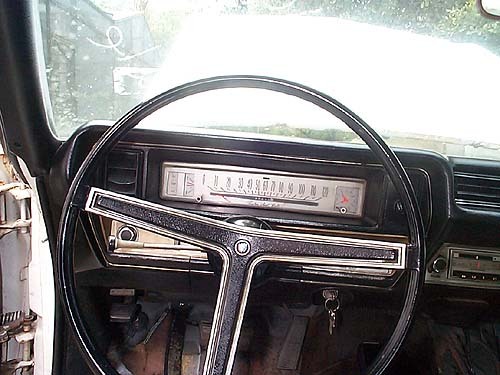 Notice key is located in the dash. In 1969 the key is located in the steering column. 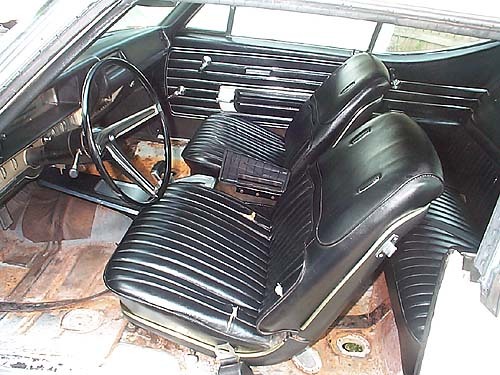 So, 1968 is a unique year for steering columns and dash layout. Nice pic. of the buckets and console. Console is in exc cond except for broken lid on storage area. Driver's seat has a few small tears but not bad for 34 year old original seats. Very, very clean black interior. Notice previous owner has remove factory drain hole plugs from interior to let water drain. Floors are solid but water is entering the pass. compartment. 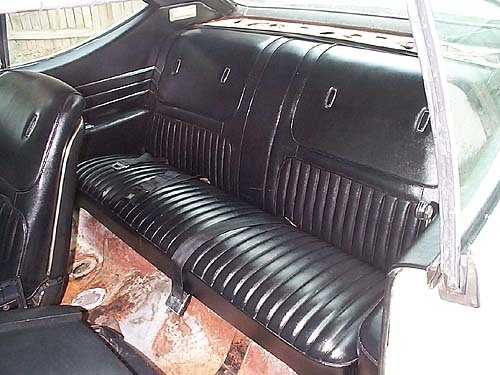 Nice clean rear seat, probably never used. Seat is like new even though it is original and 34 years old. Seat belts are in exc. cond. Pass. 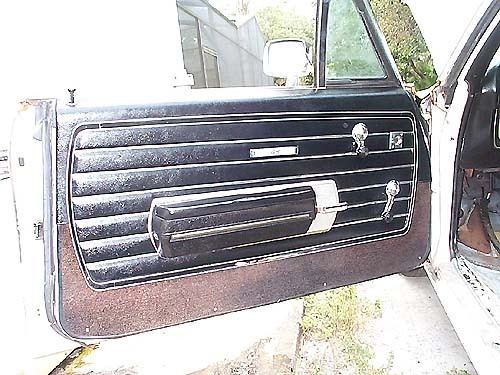 side door panel in exc. cond just like the driver's side. Carpet portion needs to be dyed with SEM vinyl dye for new look. Not much rust under orig. vinyl top. 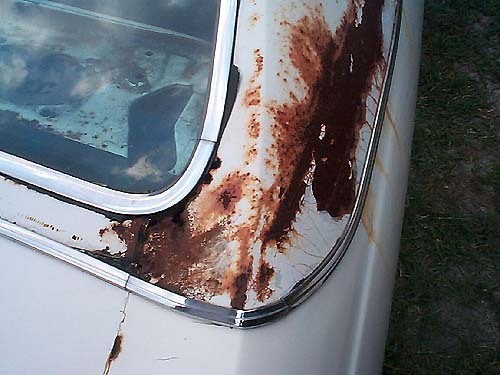 Rust around rear window is typical.Car has exc. vinyl top trim w/no blister or pits in trim pieces. This is always a problem area on Skylarks. 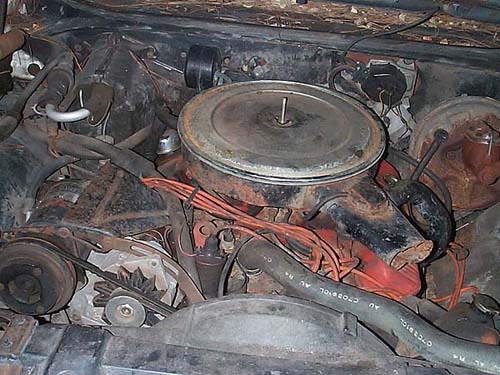 Rust has eaten away the radiator core support and inner fenderwell. Luckily there are patch panels for these items. The white that is shown in the picture is the bottom of battery. 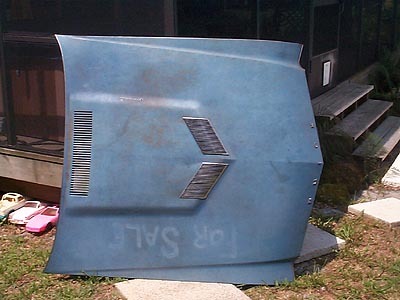 This is a factory 68 GS hood. The scoop is for looks. It differs from a Skylark hood in that it has two stainless trim pieces bordering the scoop. Skylark hood has one trim piece down the center of the hood. 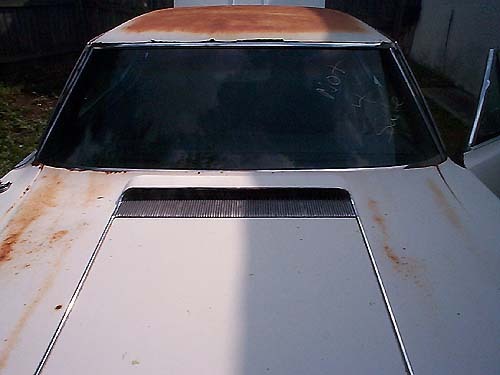 1969 has a true ram-air hood as shown below. The scoop mating plates on the bottom match up with a dual snorkel air cleaner to provide fresh, cool outside air to the carb. This is common on Skylarks due to leaves and other debris collecting inside the lower fender. As shown in this photo, notice the pine needles and oak tree leaves. 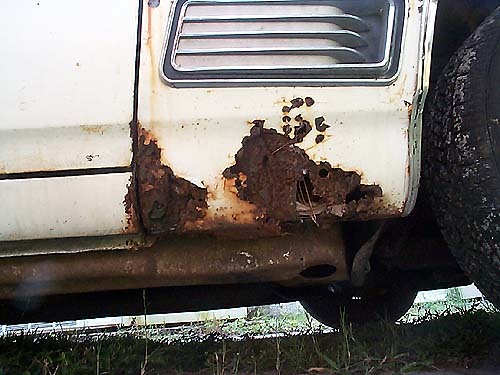 Once water mositens the debris it stays wet for a long period of time and causes the fender to rust from the inside out. This fender should be replaced. 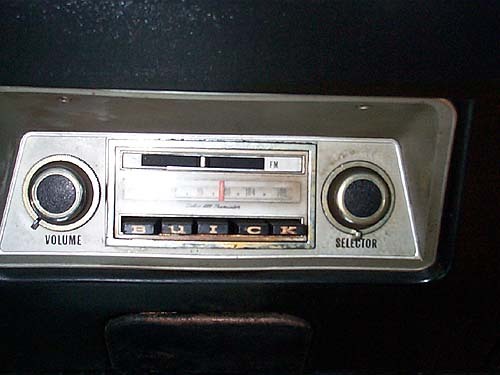 Nice condition am/fm radio for 1968. Not commonly found in 1968/9 models. This is nice original engine bay. Typical of a 34 year old car. Notice car has all original parts. Even AC compressor is original w/oversize pulley and original Frigidaire label still legible. Car has correct air cleaner assembly (center air cleaner stud is incorrect. 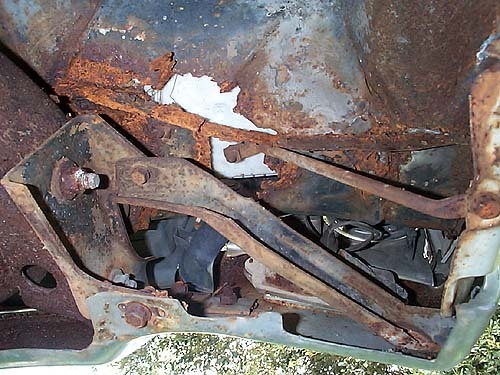 Car has clean frame rails and rear axle. Notice posi ID tag on rear axle. This car has a 3.42 posi rear. 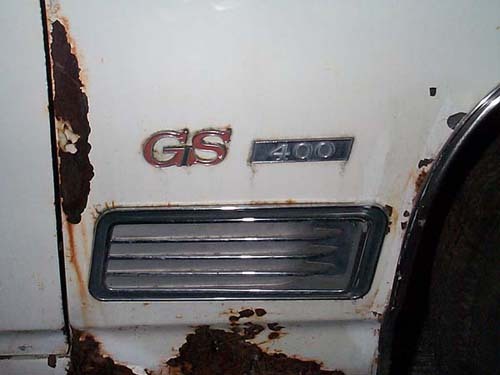 A posi rear was an option on GS models and not a standard feature as many people believe. This car does not have the rear sway bar. Gas tank is not badly rusted on bottom. These items are in decent cond. The GS emblem is available as a reproduction item. The 400 is not and neither is the simulated vent. The vent is a Skylark GS only item and is very difficult to find without blisters/pitting. 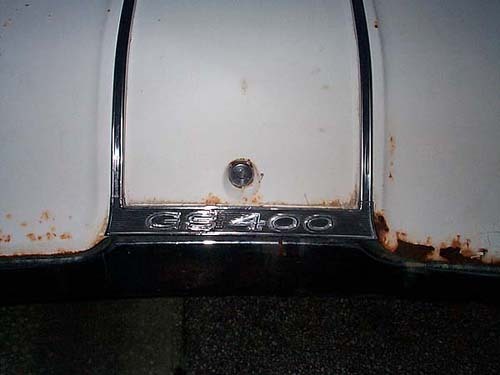 The 400 emblem was used on other models such as the LeSabre. This is the driver's side, again all are in exc. condition. 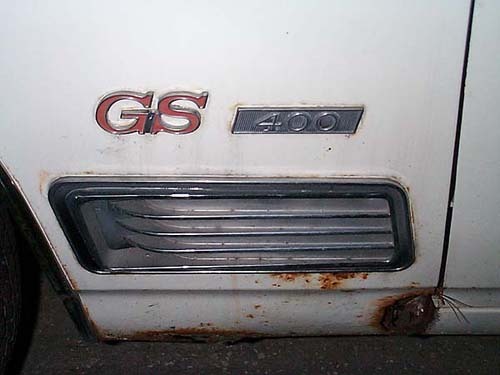 This is the GS400 emblem found on the trunk. This item is not available as a reproduction . In order to determine what should be done with this car, one needs to look at restored examples and their current pricing. 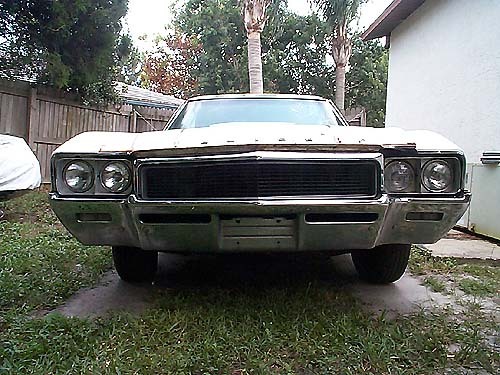 As of 8-24-02, a nicely restored 68 GS400 with similar options as this one may sell for $7000-9000. The next step is to determine what parts are available as reproduction/replacement parts and how much work you can do at your shop/home. 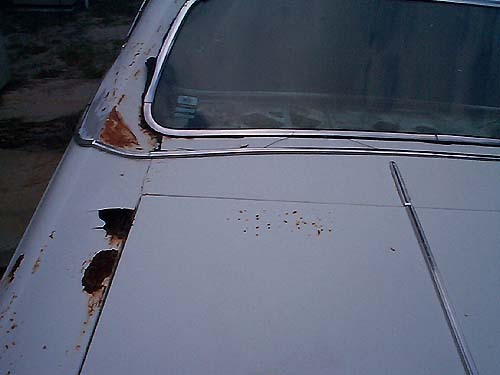 Since the car has so much rust, it is not worth the time, effort and money to restore unless you can find a clean rust-free Skylark shell to replace all the rusted out areas. 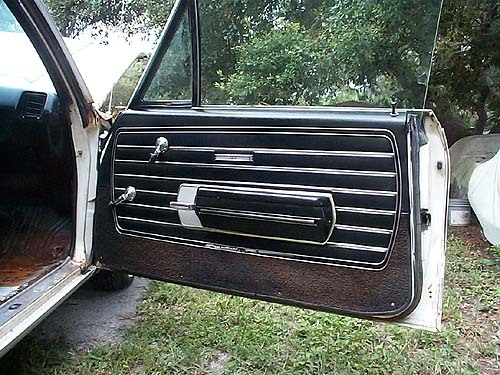 Since this car needs a whole new body except for doors, this car is better off as a parts car. 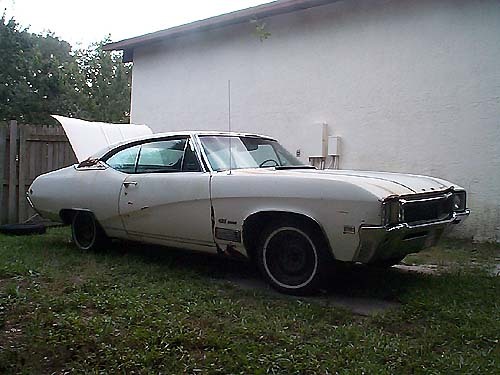 Sometimes it is best to use this example for parts and find a better car to restore. Best idea is to let someone else do all the work and then you can buy the restored car for 50 cents on the dollar spent. Order several catalogs and start adding up the parts amounts you will spend for a restoration and you will be surprised what sometimes trivial items cost. 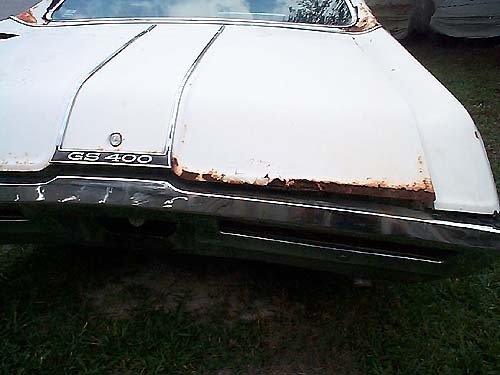 This car would take at least $10,000 to be restored(body-off restoration) and maybe more. When completed, you will have spent more than the car is worth. It is your money and only you know how you would like to spend it. For more help, join the e-mail list on the site.